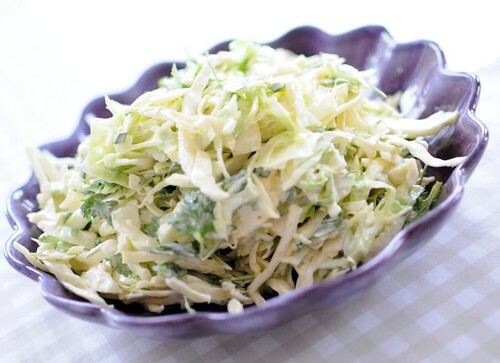 Here's the awesome slaw I made for Fourth of July. The idea came from my food idol The Pioneer Woman, but I switched up the dressing a bit, and couldn't find any decent red cabbage. Finely shred the cabbage. De-seed and finely mince the jalapeño. Whisk the mayo with yogurt, milk, vinegar, salt and sugar. Toss with the salad, and season to taste. Leave for an hour or two, to let the flavors develop. Add the cilantro and toss, right before serving. Thanks so much for posting this. I can't wait to try it (even with mayo ;)). PS: I also made your onion straws with that cayenne pepper was great! Thanks!